Blog Kefirshop.eu - Information about kefir, kefir ferment, milkkefir, waterkefir and instructions for making kefir. Information about kefir, kefir ferment, milkkefir, waterkefir and instructions for making kefir. Milk kefir is a fermented milk product similar to yogurt and buttermilk. Kefir is a unique product. Milk kefir can easily made at home, you just need milk kefir grains and milk to make kefir at home. Milk kefir grains can be obtained at our Kefirshop. In order to make kefir you do not have to heat the milk, such as in yogurt making. 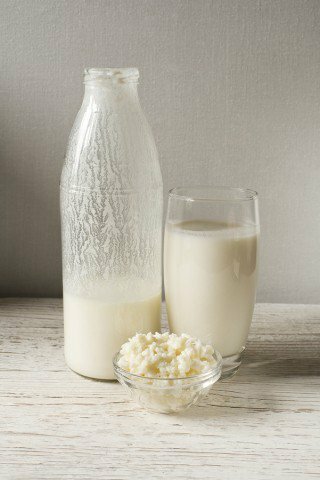 Kefir can be made with milk at room temperature. Fresh reusable kefir grains are not real grains, but they are small, rubbery cauliflower-like cell structures consisting of bacteria and yeast. Milk kefir is fairly well known, the beverage is sold in most supermarkets and almost in all health food stores. Milk or dairy kefir is usually made with fresh cow milk, goat or sheep milk. But kefir can also be made with coconut milk. Milk kefir can also be made with a starter powdered starter culture, also known as Freeze Dried Kefir Starter or Kefir ferment. Making your own kefir with a kefir ferment is very easy, just add the contents of the sachet to the right amount of milk and you'll have a delicious homemade kefir after 24 hours. Fermented milk kefir has a tart taste, which is somewhat similar to the taste of Greek yogurt. How strong the taste is depends on how long the fermentation period was; a longer fermentation usually leads to a stronger taste, shorter fermentation produces a milder kefir. Kefir can be further flavored, similar as yogurt. Most famous trendsetters are; fresh fruit, cane sugar, honey, maple syrup, vanilla extract or stevia extract. Also try some pureed fruit to add to your kefir (such as blueberries, blackberries). Besides drinking Kefir, there are many other ways to use kefir in recipes. Kefir can also be used in soups, salads and stews, to replace sour cream or yogurt. Kefir is a unique dairy product that is one of the best probiotic foods there is and it has an incredible amount of health benefits. For centuries, kefir has been used in the Russian and Asian folk medicine to cure a variety of ailments. This entry was posted in Milk kefir and tagged Milk kefir, Make kefir at home, Milk kefir grains on 13 September 2016 by Kefiran. Tibicos is a fermented beverage made from water and sugar (1). Water kefir is a source of probiotics. Water kefir is easy to make and has a slightly sweet and yeasty flavor, depending on how the kefir was prepared. Water kefir may contain a small amount of alcohol (up to 2%), during the fermentation carbon dioxide is created. Water kefir is a wonderful source of beneficial bacteria, and has various vitamins and folic acid. Water kefir is also known as tibicos, tibi or Japanese water crystals. Water kefir is made with water kefir grains. The water kefir grains look like small, clear gelatinous structures consisting of various bacteria and yeasts. The fermented drink, the drink itself can bought in the better department stores, usually bottled in glass bottles. With fresh kefir grains you can make water kefir forever, if provided with proper care and attention. The water kefir grains can be bought at our Kefirshop. If you can't consume dairy products than Water kefir is an excellent lactose-free probiotic beverage. Other probiotics which are dairy-free: kombucha and sauerkraut. Water kefir is very different than Kombucha, with various bacteria and yeasts, various nutrients, multiple therapeutic benefits and a completely different taste. You may not compare them. You can make Water kefir with a variety of fruit, coconut water and various types of sugars. You can ultimately decide which flavor you want to achieve and I encourage everyone to experiment with (2). After you have brewed the Water kefir, you can add yet another flavor. You can even ferment the resulting beverage further in a bottle and it's possibly to add seasonings. The fermented liquor is best stored in the refrigerator. You may drink Water kefir at any time of the day. If you just start drinking Water kefir it is best to start with one glass a day, building up drinking Water kefir, let your body speak. The consumption differs really from person to person. Water kefir is a powerful probiotic. 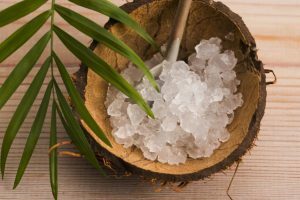 1.Best use organic raw cane sugar; but white sugar, agave, maple syrup and palm sugar can also be applied. Feel free to experiment with natural sweeteners. 2.Best experiment with some spare kefir grains. With the excess of kefir grains you can experiment. If you want to save a backup of kefir grains; you can save them for a short time at some water and sugar in the fridge. If you wish to store them for a longer period, you may dry the kefir grains on some oven paper and if they are dry, store them in a cool and dry environment. This entry was posted in Water kefir and tagged water kefir, Make water kefir at home, Kefir grains on 13 September 2016 by Kefiran.